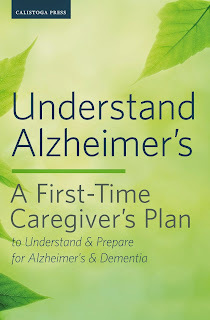 Understand Alzheimer's: A First-Time Caregiver's Plan to Understand & Prepare for Alzheimer's & Dementia is an in-depth manual. It's like having a good friend, neurologist, lawyer, and care professional to explain what is happening to your loved one in plain English. It will assist you in realistic, everyday planning in a simple and compassionate way. An entire chapter is devoted to helping you stay healthy while taking care of someone with Alzheimer's. Understanding Alzheimer's prepares first-time caregivers to understand, cope and help out. It is like a conversation with a knowledgeable friend, who calms you down and offers the advice needed to carry on.